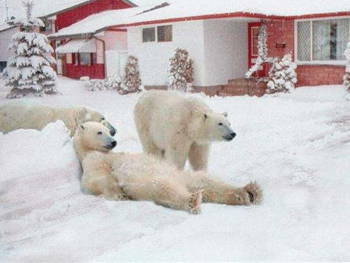 Claim: Home security, as practiced in Manitoba, Canada. 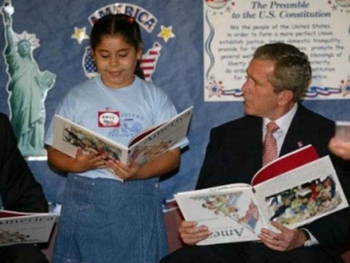 Claim: President Bush reads a book upside-down. 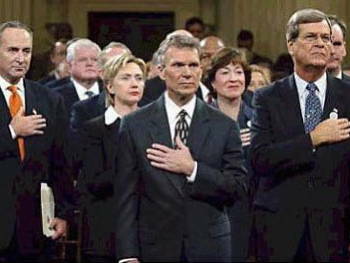 Claim: Senator Tom Daschle of South Dakota uses the wrong hand while repeating the Pledge of Allegiance. 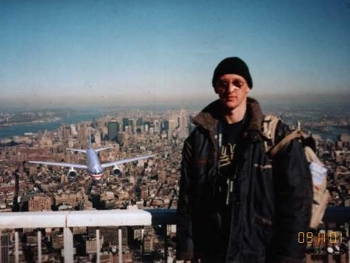 Claim: A simple tourist getting himself photographed on the top of the World Trade Center just seconds before the tragedy of 9/11. The camera was found in the rubble. 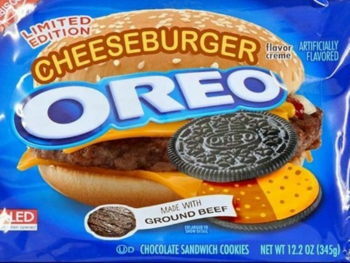 Claim: And you think you're having a bad day at work!! 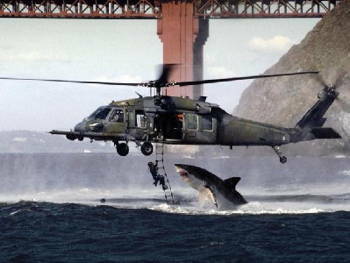 This photo was taken near the South African coast during a military exercise by the British Navy. 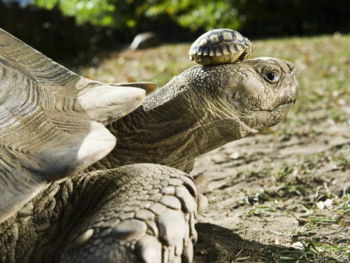 It was nominated by National Geographic as "THE photo of the year." 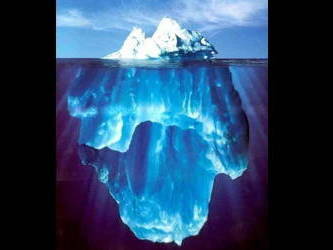 Claim: This came from a Rig Manager for Global Marine Drilling in Newfoundland. The water was calm and the sun almost directly overhead so the diver was able to click this pic. 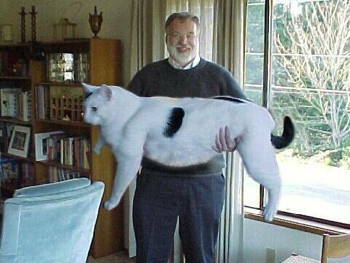 Claim: 'Snowball' is an 87-pound cat owned by Rodger Degagne of Ottawa, Canada who adopted the cat's mother after finding her abandoned near a Canadian nuclear lab. Snowball was a normal-sized kitten at birth, but just kept growing! 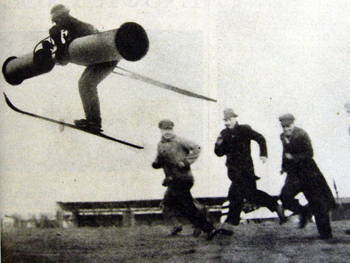 Claim: A man flies by means of his own lung power. By blowing into a box strapped to his chest, he makes two rotors revolve, and soars from a runway into the air near Berlin. 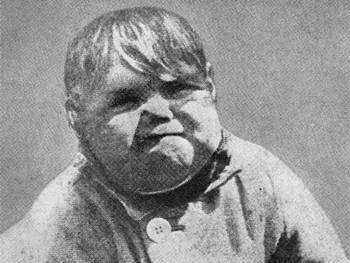 Claim: Adolf Hitler as a baby. 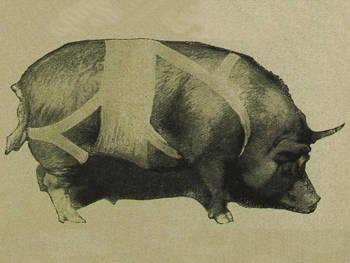 Claim: A german farmer has devised a way of obtaining lard from live pigs. He applies an injection of novocaine to the parts about to be sliced up, cuts out a layer of fat, and sews the skin back up. The operation can be repeated 3 times a year. This is a pig after the operation. 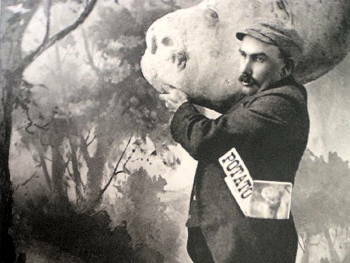 Claim: The biggest potato on record. It was grown by J.B. Swan of Loveland, Colorado and weighs 86 lb 10 oz. 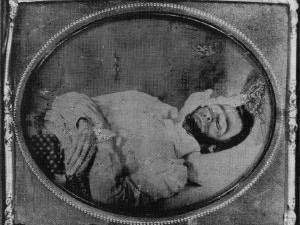 Claim: The dead President Abraham Lincoln, lying on display in his casket.